Conservators worked on an oversized easel, allowing them to work upright and in natural daylight. 1948 Scene, Mural 5. 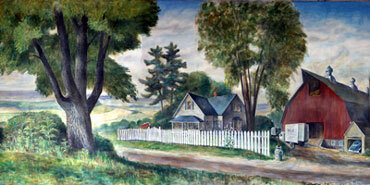 The modern farmstead with its neat, well-kept house, yard, and red dairy barn was a common rural scene in 1948. 1848 Scene, Mural 6. Farmers harvesting winter wheat. 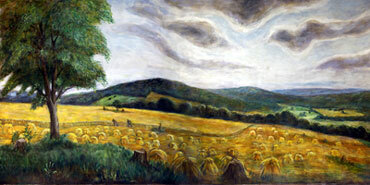 Wheat became a major crop in Wisconsin around 1840. This exhibit brings to life a series of 14 stunning, large-scale historic murals originally displayed at the 1948 Wisconsin State Fair in celebration of the state's centennial. 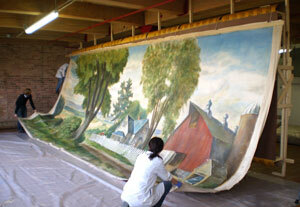 The murals were developed to tell the story of Wisconsin's agricultural growth and development from 1848-1948. After decades of lying dormant, nine surviving murals were rediscovered, cleaned and conserved. Digital scans of the nine large-scale restorations and five small-scale study sketches are now available for you to scroll through in the order they were originally displayed in 1948. 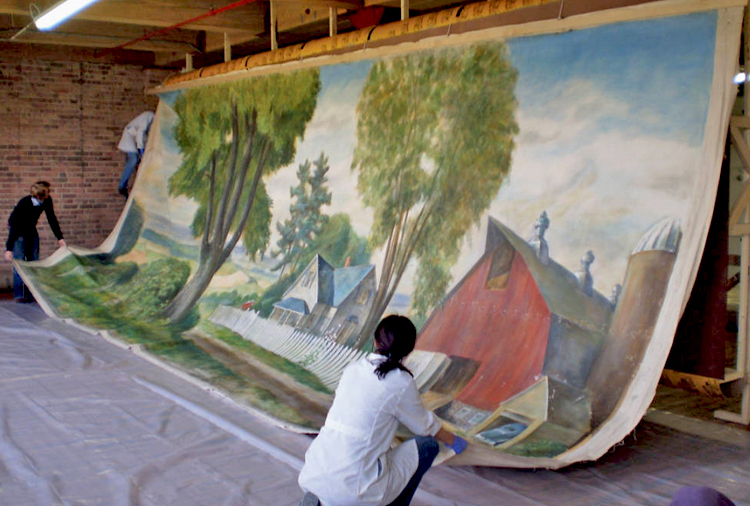 The "1948 Wisconsin State Fair Murals: 100 Years of Agricultural History" interactive project marks the first time since 1948 that these murals are presented together. To scroll through the exhibit, click on the arrows at the bottom corners of the mural. To jump to a specific mural, click on an image in the thumbnail bar at the bottom of the page. To see popups explaining significant details of each mural, click on the question marks. Many will include corresponding historic images from our collections. To zoom in on any part of the mural, click on the magnifying glass icon in the upper left hand corner of the mural. To move around the mural while in a zoom mode, click and drag the cross arrows that appear. Or click and drag the small dark rectangle in the box in the upper right hand corner of the mural. The box also serves as a guide to let you know what part of the mural you have zoomed in on. This digital exhibit and mural restoration was created through the generous financial support of the Kohler Foundation, Inc.